As part of its ongoing efforts to improve the News Feed experience, social media behemoth Facebook is currently in the process of testing a new feature that will allow users to disable posts based on the words they contain. 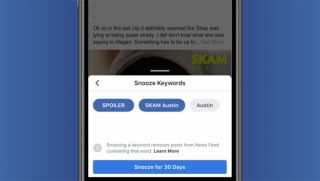 This new Keyword Snooze feature will work in a similar way to the platform’s existing snooze functions, which blocks posts from showing up on your News Feed for 30 days, whether they be from a person, a page, or a group. The Keyword Snooze tool differs in that it will give users the choice to block any post that contains the specific word (or words) that you choose. The primary purpose of this is to avoid spoilers for specific shows, movies or events, but the applications could spread to avoiding topics you’re simply sick of hearing about. Flawed feature from the start? While the feature has only just begun its testing phase, the approach Facebook has taken seems to have a slight flaw in its operation. In order to activate Keyword Snooze, you’ll need to click on a specific post’s menu option and select which of the relevant keywords from the post you’d like to shut down for the next 30 days. This implies you’ll need to have already seen the post, and hence, most likely, the spoiler itself, before you’re able to avoid future references. Regardless, if you’ve managed to catch the word “spoiler” at the beginning of a post, or seen that it has an image from your favourite Netflix show that you’re yet to catch up on, maybe you’ll be able to quickly activate the setting without having it ruined for you. As the setting is in testing, we’re yet to learn when it will officially arrive, but as with other News Feed alterations, expect to see it rolling out in the coming months to clumps of users at a time.